Why Won't President Donald Trump Condemn White Nationalism? Why Hasn’t President Donald Trump Condemned White Nationalism? Trump has shown uncharacteristic caution and a reluctance to distance himself from the hate while he was a candidate, and still as president. His silence in response to the violence that erupted in Charlottesville a year ago was even cheered by the white supremacist website Daily Stormer. Why doesn’t President Donald Trump just unequivocally condemn white supremacists? It’s a jarring question to ask about an American president. But it’s also one made unavoidable by Trump’s delayed, blame-both-sides response to the violence that erupted in Charlottesville a year ago when neo-Nazis, skinheads and members of the Ku Klux Klan protested in Charlottesville, Virginia. Trump has faced such a moment before – one that would have certainly drawn swift, almost predictable condemnations from his recent predecessors, regardless of party. As a candidate and now as president, when racial tensions flared or fringe groups rallied around his message, Trump has shown uncharacteristic caution and a reluctance to distance himself from the hate. At times, his approach has seemingly inflamed racial tensions in a deeply divided country while emboldening groups long in the shadows. 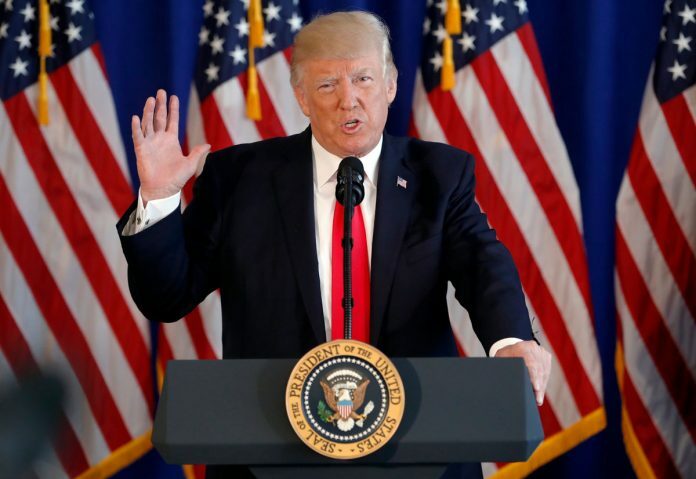 After the Charlottesville incident, Trump read slowly through a statement about the clashes that left dozens injured and one woman dead, condemning hatred, bigotry and violence “on many sides.” But the president was silent when journalists asked whether he rejected the support of nationalist groups. Trump denies that he’s racist or sympathetic to such groups. Son-in-law Jared Kushner, the grandson of Holocaust survivors, and daughter Ivanka, who converted to Judaism, are among those who have defended the president against those charges. Still, he has a history of engaging in high-profile, racially fraught battles. Early in his career as a developer, Trump fought charges of bias against blacks seeking to rent at his family-owned apartment complexes. He long promoted the lie that the nation’s first black president, Barack Obama, was not born in the United States. As a candidate, he proposed temporarily banning Muslims from the United States. He retweeted a post from accounts that appeared to have ties to white nationalist groups. And he was slow to reject the endorsement of former KKK leader David Duke. Some of the president’s friends and advisers have argued that Trump is simply refusing to bend to liberals’ desire for political correctness. A boastful, proudly disruptive politician, Trump often has been rewarded for saying impolite and impolitic things. Some supporters cheered him for being someone who said what they could not. Democrats frequently assert that Trump sees a political advantage in courting the support of the far right. Indeed, he has benefited politically from the backing of media outlets such as Breitbart or InfoWars. They have consistently promoted Trump and torn down his opponents, sometimes with biased or inaccurate reports. White House senior adviser Steve Bannon ran Breitbart before joining Trump’s campaign, and several of the president’s other aides believe Bannon continues to have influence over the website. In “Devil’s Bargain,” a new book about his role in the Trump campaign, Bannon is quoted as saying that attempts by Democratic presidential nominee Hillary Clinton to tie Trump to the alt-right and nationalists did not move voters. “We polled the race stuff and it doesn’t matter,” Bannon said, according to the book. The reaction from Republicans following Trump’s statement on Charlottesville suggested there may be greater political risks for the president in aligning himself with bigoted groups. The spokeswoman who issued the statement refused to be named. And the president himself remained silent. A year after, the president squeezed a Tweet among others criticizing the FBI and taking credit for low unemployment rate for African American and Hispanics. But the president has never visited Charlottesville since the incident, has never been publicly on the side of those protesting white supremacists, KKK, neo-nazi and all extremist groups. The president is still sitting on the fence. It’s a jarring question to ask about an American president. But why won’t President Donald Trump condemn white nationalism? Or white supremacists as well?